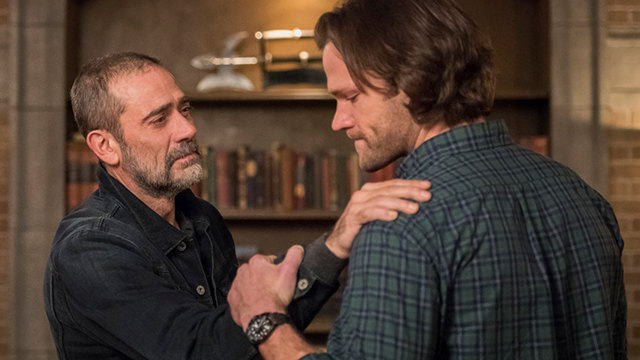 After last week’s emotional confrontation between the brothers and Dean choosing to keep fighting after Sam’s breakdown, Jared Padalecki, Jensen Ackles, Samantha Smith, and guest star Jeffrey Dean Morgan reunited the Winchester family in one big, cathartic cryfest. The 300th episode introduced us to the town of Lebanon and some of Sam and Dean’s neighbors, while also honoring the legacy of the Winchesters, all they’ve been through, who they are now, and providing much-needed closure. 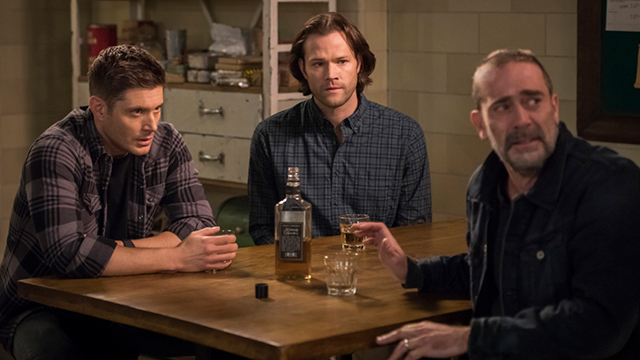 The Winchesters have lived in the Men of Letters bunker for a few years now, and this is the first time we really get to explore the community they call home and what some of the townspeople think of the mysterious brothers. Sam and Dean venture out on a case outside of town, tracking down a man who killed a hunting buddy and works at a pawn shop, specializing in occult objects. After Dean kills the pawn shop owner before the guy can slice up Sam, they pack up the lethal items and head back to Lebanon. In town, a group of teenagers are discussing Sam and Dean as the brothers, using the last name alias of Campbell (Mary’s maiden name), pull up in front of a bar/liquor store. Inside, Sam tells Dean that one of the occult objects now in their possession is called the Baozhu, a pearl that grants wishes. Specifically, it “gives you what your heart desires.” The brothers come to the conclusion that they might be able to use it to wish Michael out of Dean’s head. After the kids disperse outside, one of the teens, Max, wants to impress the girl she’s crushing on, so she steals the Impala and takes it to a party. Sam and Dean question another teen, Eliot, who tells them Max is new in town and he doesn’t know where she lives. 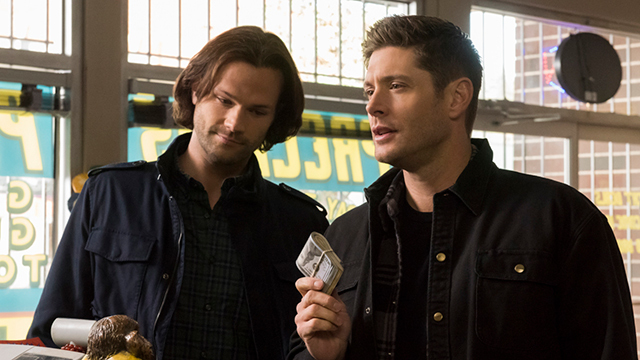 The brothers — with the help of Dean’s flirting — are able to get the location of Max’s mother out of the post office lady. After finding out where to locate the teens, the Winchesters arrive in time to take out John Wayne Gacy’s ghost (wonderfully playing on Sam’s love of serial killers and fear of clowns). Eliot, Max, and Max’s crush witness the brothers taking out the ghost clown. After having the talk about how things really do go bump in the night, the kids are now privy to Sam and Dean’s hunting secret, much to Eliot’s delight. Back at the bunker, Sam and Dean put the pearl to the test, but Dean’s heart is more focused on reuniting the Winchester family than getting rid of Michael. John Winchester suddenly appears for the first time since Season 2, except John thinks it’s 2003 when Sam was in college at Stanford in Palo Alto. After their initial shock of seeing their father again and explaining that it’s actually 2019, the brothers give their dad a quick rundown on their lives over the past 16 years. John seemingly learns that he died, his boys saved the world (more than once), God and Lucifer are real, his father, Henry, was part of the Men of Letters, and his sons are now living in a bunker with an angel and Lucifer’s kid. John tells Sam and Dean that he wishes he had been there to see it all, but he’s happy to know that he went out killing Yellow Eyes, avenging Mary’s death. It’s then John discovers Mary is alive again, and the two share an emotional reunion as the brothers step out. Alone, Sam shares his concerns with Dean about the consequences of messing with time travel due to their dad’s presence. Dean doesn’t want to hear it, though, just happy to have the four of them together again. 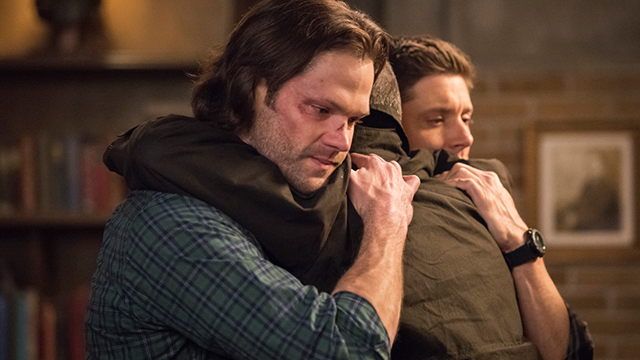 Sam finds John alone, and the two have a much-needed and very emotional talk. John tells Sam that he screwed up with him a lot and pushes Sam to hash out the past when Sam tries to avoid the conversation, saying it’s okay. John disagrees, and Sam admits that yeah, his dad did a lot of messed up things. But, Sam explains that for him, the fight they had before Sam left for college was a lifetime ago. When he thinks of John now, he thinks of him dying on the hospital room floor. Sam only really thinks about how he never got the chance to say goodbye. Both in tears, John apologizes to Sam, and Sam says sorry back. Sam says that John fought for them and loved them and that that is enough. Afterward, Sam catches up with Dean and tells him that he was right, asking to come along with Dean on his shopping trip. The two take off together to grab some items for Mary, who is planning on making her Winchester Surprise casserole for the family dinner. When the boys go back into town, suddenly none of the usuals, including Jackson at the bar or Max, know them. Sam spots a wanted poster of Dean, and Dean shows Sam an online video of a different version of Sam who runs a law firm, loves kale, and apparently gives TED talks. Sam realizes they are in a temporal paradox, that pulling John from 2003 is causing time to self-correct, changing to the new timeline. The self-correcting timeline includes an alive-again Zachariah, who Dean killed in Season 5, and a Season 4 version of Castiel who doesn’t know the Winchesters, seeking out whoever has been messing with time. As the angels attack the brothers, Sam is able to kill Zachariah and blast Castiel away with an angel banishing sigil before the alternate version of their friend can kill Dean. Sam and Dean arrive back at the bunker and give John and Mary the bad news. If they don’t get John back to his normal timeline, everything will change, including Sam never coming back to the hunting life with Dean. All the boys have been through and accomplished will cease to exist, meaning Mary will also fade away. For John, it’s not even a choice. He’s willing to go back to his own time and lose his memories of this Winchester family reunion if it means keeping Mary alive. As Sam and Mary talk in the kitchen, John tells Dean how proud he is of him and the man he’s become. John says that he had never wanted them to be hunters their whole lives. He had hoped Dean would get a normal and peaceful life with a family. Dean tells him that he does have a family. 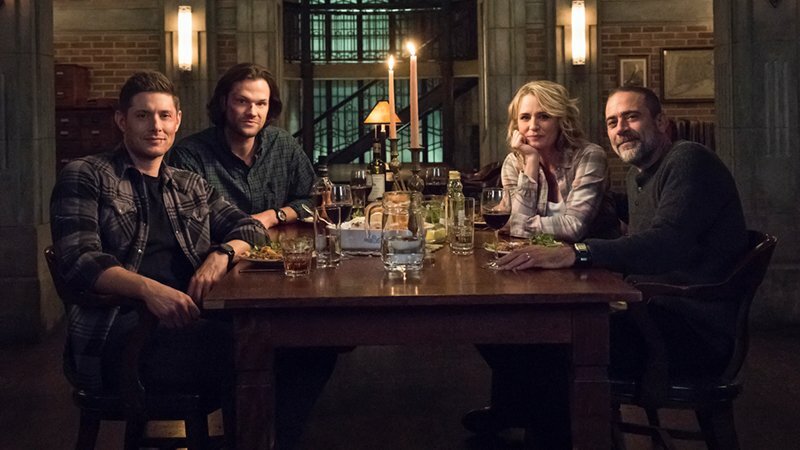 Before they send John back to 2003, the Winchesters get the opportunity to have a real family dinner together. John says goodbye to “my girl,” telling Mary how much he misses her, before hugging Sam and Dean. He tells his sons to take care of each other, and Sam says that they always do. With tears, hugs, and goodbyes shared, Sam destroys the pearl, and John’s hand fades from Mary’s as he’s taken back to 2003. In the past, John wakes up in the old Impala, thinking it was all just a dream. What did you think of the Supernatural 300th episode? Let us know in the comment section below!